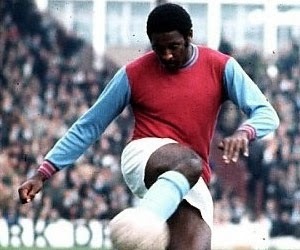 Bermuda-born Clyde Best was one of the first dark-skinned soccer players that lightened up the English First Division, back in 1969. Best had a decent career, despite constantly being racially abused during his years in England. and while in the Netherlands Feyenoord supporters don’t think much of him, he is a real hero in Tampa Bay. The Tampa Bay Rowdies won the 1975 NASL-championship, with Best playing a decisive role in it. 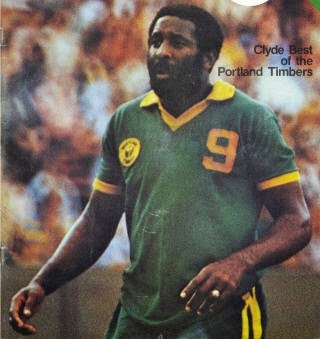 Admired and maligned, Clyde Best was a true cult hero. Clyde Best was born in Somerset, Bermuda on February 24, 1951. As a young guy he played soccer for Somerset Trojans. He was league champion in 1966, allowing his club to play in the CONCACAF Champions Cup. The Caribbean zone of that Cup was played in Jamaica, January 1968. While Somerset Trojans didn’t qualify for the final, Best did a great job for a 16-year old. The big guy in his team was Randy Horton though, six years older and top scorer of the tournament with four goals. Best scored one goal, but was already on the radar of some English clubs. Six months earlier he helped his country Bermuda to second place at the Pan American Games. Being only sixteen, his performance obviously was noted. Best was eventually contracted by London based West Ham United. 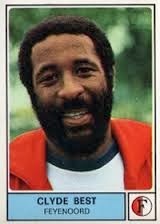 His companion Horton waited a few more years and then moved to New York Cosmos, where he was a big success. 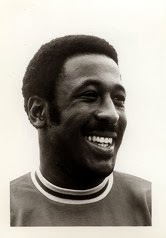 Horton was top goal scorer in the league in 1972 and scored a total of 37 goals in the NASL, most of them for the star struck New York Cosmos team. After some adjustment time, Best was ready to make his debut in English soccer. 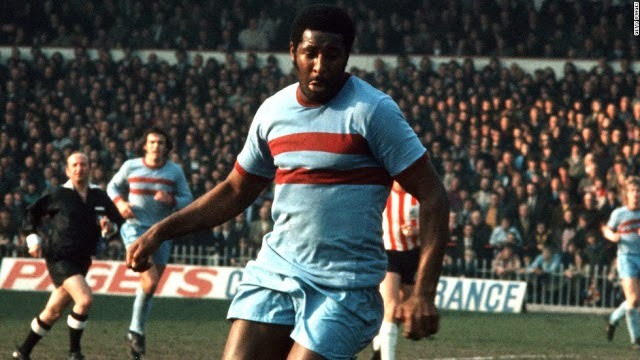 Even as a youngster he was a strong and powerful man (nearly 1.90 metres), just the kind English soccer was known for. At the same time, Best was one of the first black players in the English league, coming from the empire and commonwealth nations. Only guys like Lindy Delaphena from Jamaica (Portsmouth) and Albert Johannesen from South Africa (Leeds United) were well established black players before him. As English crowds were quit ignorant, Best got a lot of abuse from away fans. The ‘monkey chant’ was particularly offending. Racism in those days was completely unbridled and even his own fans something indulged in it – only when Best played poorly, of course. His worst nightmare was a letter he received at home, prior to an important game. It read that supporters from the team West Ham United played against (Best didn't talk about it then, and doesn't want to reveal the name of this club in retrospect) would throw acid in his face, if he dared to show himself on the field. Of course, Best did play that match, but was sure to get through the tunnel as quick as he could. On the field, his first years at West Ham United were great. Best made his debut on August 25, 1969, in a League Cup-match against Halifax Town (4-2, one goal by Best). In those days West Ham had class players like Bobby Moore, Trevor Brooking, Billy Bonds and Geoff Hurst. Especially teaming up with Hurst got Best to score lots of goals. His best season was 1971-72, when he scored 17 league goals and played all 42 league matches. After that year, Hurst left for Stoke City, and Best had a much harder time finding the back of the net. Slowly but gradually, Best lost his place in the starting line-up. So when West Ham United won the FA Cup (1975) and reached the final of the European Cup for Cup Winners in 1976, Best wasn’t playing. That’s why Best turned to America’s NASL, to compensate for his lack of playtime during the summer. In his first season with Tampa Bay Rowdies Best instantly won the championship, scoring a great all decisive second goal in a 2-0 victory in the final against Portland Timbers. In the summer of 1977, Best tried something new, returned to Europe but now aiming at the Netherlands. He was given a contract by Dutch club Feyenoord, who were in a difficult spot at the time. They just finished fourth in the league, after twelve years of being either champion (four times) or number two (eight times). Feyenoord’s best players had left the club, including Wim van Hanegem, or retired. In Rotterdam they wanted Best to be the great striker they’ve lacked since Swedish Ove Kindvall left the club in 1971. It didn’t work out, newspapers made fun of him. And they were right, Best didn’t perform at all. In a Dutch league where defending is basically rather poor, Best scored only three goals in 23 league matches. His appearance didn’t help either. He had grown a full beard and looked years and years older than he really was – just 26 when the season started. On top of all that, Feyenoord only managed tenth place that season. So it was not just Best who should be criticized. 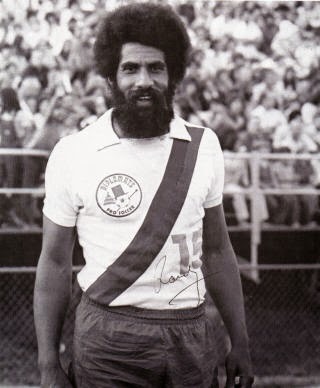 Best left the Netherlands after that year and managed to play a few more years, until 1982, in the NASL for Portland Timbers and Toronto Blizzard. Then he returned home to Bermuda. Best was national coach for a while (1997-1999) but failed to get good results. He now has his own Clyde Best Foundation, trying to collect and archive memories of soccer in Bermuda and helping young kids to develop their soccer skills. Clyde Best was my coach about 25 years ago when I was in high school. He was a great coach, a great person, patient, and I am thankful for the privilege to have had him as a coach and a mentor. Thank you Clyde! Good to hear that, Michael!